## and different output modes including interlaced format for use in non-3d specific players e.g. windows media player. ## Optional aspect ratio maintaining quality resize for 3d monitor target resolution. ## Very cpu intensive, may be for offline use only, e.g. in virtualdubmod. ## 2x 3.0ghz cpu may give you a framerate of 16fps while running the whole script in virtualdubmod including xvid compression in HDTV quality saving setting. ## Offers great quality in the result video for fullscreen playback in every .avs capable player later. ## Also reduces ghosting if the original file resolution is smaller than the target resolution. ## For 19" Zalman use 1280, for 22" Zalman Trimon it is 1680 etc. ## Commenting out the above resizing maintains realtime capability! ## Output the two video frames in a page flipping format for shutter glasses etc. ## Ueed for Zalman Trimon, Acer Aspire 3D etc. The new singlethreaded version of the script requires you to download and install AviSynth on your PC. If you have trouble running it with a high resolution video files (720p or above) you may try the multithreaded version below, just don’t forget that you should have a multicore system for it. And don’t forget to save the code above with AVS file extension and to replace the Avatar_Trailer_HD.avi with the name of the video file you want to play. ## For this to work you need to have AviSynth with MT mod 0.7 installed!!! For the multithreading version, besides the need for Avisynth, you’ll also need to download the latest Avisynth MT mod and then apply it. This means extracting the MT.dll library in the plugins folder of the Avisynth installation and then overwriting the original avisynth.dll with the modified one (\Windows\System32 for 32-bit OS or \Windows\SysWOW64 for 64-bit OS). After that you’ll be ready to run the script and see that all the available cores of the CPU are being used for processing and thus get a better framerate than with the singlethreading version of the script. You can download the two scripts along with Avisynth and the MT mod in a single archive file to save you the trouble of getting all the separate files you need. And as always don’t forget to share your comments if you try the scripts and any ideas for further improvements are more than welcome too, especially if they are related to improving the performance as this is a bit of an issue at the moment. I am no vice on this 2D to 3D conversion but I hope some one in this thread will help. I have tried many software programs but failed to get what I need. I have one 2d film here. Could some one convert this to 3D and send me? 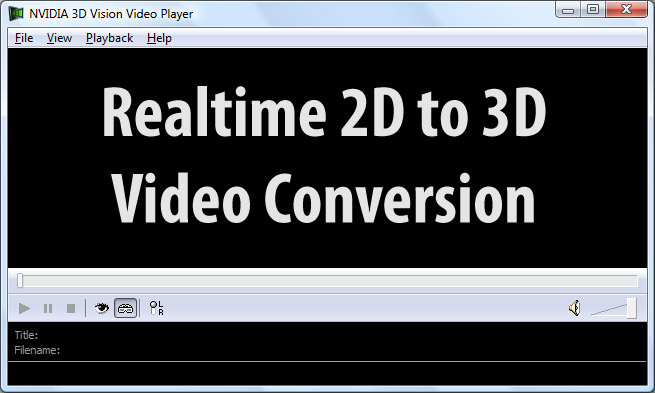 Also please let me know how I can feel watching the converted video as a real 3D video? I tried this with an episode from family guy, just to see what it can do with a cartoon, and i was impressed by what it picked up, some spots were a little weird looking, but as for the most part, it worked quite well. I changed the code name of Avatar to the movie I wanted to play and saved them in the same Directory but did not work? i tried the script and i got results with all of the options – except one, but they were either side by side pictures or blurred pictures, not 3d. so i guess i need 3d glasses to see the 3d picture, right? or maybe, do i need some special hardware? if it is a matter of glasses, what kind of glasses should i use? i happen to have Real D glasses with me, but they didnt work with neither of the options. so is it possible to include an option for the REAL D glasses, too? Every time I play the .AVS file I t makes the video play side by side instead of the red, cyan blur. How do I fix that? Okay so now I have the red – cyan video playing at half the speed. how would I fix that? Google this function and you will find complete avisynth api. My videos are coming out in a narrow, in output video height, format and I’d like to expand them to the full size of my 16:9 widescreen 3D TV. I would greatly appreciate your expertise and help. Thank you. How to I make to where it doesn’t delete frames for a seamless conversion? i am using aoc 2236vw lcd will it support to view in 3d?